Andy Rathbone » How do I retrieve what I’ve saved when I press Ctrl+S? How do I retrieve what I’ve saved when I press Ctrl+S? Q: I have a real dummy question. If I press Ctrl+S, how do I retrieve the material that I saved? 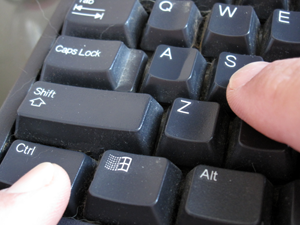 A: Holding down the Ctrl key and pressing the letter “s” is one of many Windows shortcut keys. Shortcut keys are time savers, letting you keep your fingers on the keyboard while working, rather than knocking over the coffee while reaching for the mouse. If you open an existing file, change a few things, and press Ctrl+S, your program saves the new information inside your opened file, keeping the file stored in its original location. If you create something new with a program and press Ctrl+S, the program creates a new file, asking you to choose a name and location to store your masterpiece. Most programs even simplify things by suggesting a file name and a location: They usually offer to place your new file inside one of your existing folders, depending on whether you’re working on a document, a music file, a video, or a picture. To retrieve that file later, return to that chosen folder. If you press Ctrl+S and you’re not working in a program, Windows does nothing. After all, you haven’t created any work to save. But, you may ask, how do you find the file’s location if you don’t remember where you originally saved it? On the taskbar, right-click the icon of the program that created the file; hover your mouse pointer over the file’s name, and Windows lists the file’s location in a pop-up menu. Can’t even remember the file’s name? Click the Start menu and type a few words you remember from inside the document. Windows begins listing files containing those words. When you spot the right file, right-click its name and choose Open File Location. If you know when you saved your file, search for files created within a certain date range in Windows 7. The “Open File Location” command comes in handy whenever you can spot a file’s name, but want to see the folder where it’s currently living. Posted: February 17th, 2010 under Windows 7, Windows Vista, Windows XP.